Dolly Parton's Imagination Library in Upper Tanana, Alaska! More and more affiliates of Dolly Parton's Imagination Library are coming onboard with their new "Dolly Parton's Imagination Library Websites." The Upper Tanana Imagination Library is a literacy program run through the Dollywood Foundation and Best Beginnings in Alaska to provide a free, age-appropriate book each month to children in their community who are under 5 years of age. This program serves families in Tok, Tanacross, Tetlin, Mentasta, Eagle and Northway. With their own website, this affiliate can describe upcoming events and promote awareness to a much larger online audience. The Upper Tanana Imagination Library TETLIN EVENT, announces activities for families including balloons, face painting, snacks and more. This is a wonderful opportunity to reach a wider range of parents and guardians who may also wish to enroll children or perhaps donate to the program. Dolly had some fun in Music City Saturday night, hob-nobbing with Nashville's arts patrons at the Fest De Ville event at the Tennessee Performing Arts Center, where the evening was themed “5 To 9” and saw them honor her with the TPAC's Applause Award. The cocktail hour featured two female and two male Dolly impersonators, ending with one of them singing “9 To 5,” at which time Dolly surprised the crowd by coming on stage to join (and since her entrance wasn't announced, many didn't realize it was really her). Dinner followed, after which they presented her with the award, which was given in recognition of her work as an entertainer and her impact on education through her philanthropic work of the Imagination Library, her early childhood literacy project, which provides one free, age-appropriate, expert-selected book every month to every child from birth to age 5 whose parents register in a participating community, active in more than 1,200 locations throughout the U.S., Canada and Great Britain and distributing more than 7 million books a year. FLOYD COUNTY — One year ago, the international Dolly Parton’s Imagination Library program took root in Floyd County, providing a free, book each month via mail to every child younger than 5 who signed up. Now, just 12 months later, the program grew from an initial enrollment of 1,649 to 2,797, which is higher than the five-year goal mark, said Becky King, Community Alliance to Promote Education director, which oversees the local program. With that goal in mind, CAPE is hosting a birthday party for the program, inviting all of the public to come out for crafts, games and presents, which are, of course, free books. The party is tomorrow from 10 a.m. to noon in the children’s department at the New Albany-Floyd County Public Library. Parents will also have a chance to sign up their children who are younger than 5 to receive free books. The only requirement, in addition, to age is that the child live in Floyd County. King said it’s important to make sure all children who are eligible are signed up. “We know that reading begins long before school and the more children are able to enjoy books and read with their families at home the more likely they are to become successful readers and to love books, which is just as important,” she said. In May, the Literacy Coalition of Onondaga County launched an ambitious program to mail a free book a month to every child from birth to 5 years old who lives in two targeted neighborhoods around Franklin and Dr. Weeks elementary schools. The short-term goal was to sign up 500 children in the first year. As of Monday, the number was 507 and growing. That’s great, says coalition Executive Director Virginia Carmody. “But because our numbers are way ahead, we definitely need more money,” she said. The intent of Imagination Library is for families to use books together, which builds the early literacy skills children need to succeed. Syracuse school district data show that half the children in the target area, and 51 percent citywide, lack early literacy skills. The United Way of Southwest Wyoming’s 4th Annual Golf Tournament and 1st Running for Reading 5K Fun Run and Walk are looking for participants. The events will benefit the Dolly Parton Imagination Library of Southwest Wyoming. “These events are a fun way to raise money to help start a wonderful and much needed program in southwest Wyoming,” Kelly Frink, director of marketing and communications at United Way, said. The golf tournament, set for Sept. 12, will take place at Rolling Green Country Club in Green River. The shot gun start will begin at 9 a.m. with check-in opening at 8 a.m. The entry fee is $100 per player and includes green fees, cart, breakfast, lunch and player gifts. First, second and third places will be awarded and contests will be held for closest to the hole, farthest putt and men’s and women’s longest drive. Players can purchase mulligans and tickets for the 50/50 raffle. Current-hole sponsors of the event are Erwin Consulting and Mandros Painting. The First Annual Running for Reading 5K is a fun run/walk that will take place Oct. 2. It will begin at 10 a.m. and will start and finish in the parking lot of the Young at Heart Senior Center, located at 2400 Regan Ave. in Rock Springs. Registration fee includes race fee, brunch, t-shirt, door prize ticket and gift bag. Registration and check in the day of the event will begin at 8:30 am. Children 5 to 12 years old can participate in the kids run that will begin at 11:30 a.m. To participate each child must be registered and every child will receive a participation award. Early bird registration fees are: couples/running buddies, $40; adults, $25; 13-18 years old and senior citizens, $20; children 12 years old and under are free. Early bird registration fees are good until Sept. 10. There is a special challenge to students of southwest Wyoming high schools. The high school with the highest percentage of student participation will receive a cash reward. Total amount of reward is dependent upon 5K sponsorships. The Cumberland County Imagination Library has announced a program to solicit funds from community residents to financially assist in providing books to all children from birth through five years of age. The state of Tennessee provides a matching grant for supporting the program. The current budget is $24,000, of which $12,000 must be raised by the community (by state mandate). In 1966 the Dolly Parton Foundation funded an Imagination Library for children in her native Sevier County, Tennessee. The reading program for children — from birth through age five — proved to be a valuable tool in promoting literacy. Tennessee Governor Phil Bredesen was so impressed with the results of the program that in 2000 he created a Governor’s “Books from Birth Foundation” in every county in the state. All 95 counties in the state are participating. Cumberland County ranks next to the bottom for literacy in Tennessee. Local businesses, organizations and private persons have contributed funds for the program to date, including Wal-Mart, United Fund of Cumberland County, Fairfield Glade Rotary Club, Lake Tansi Exchange Club, and Friends of the Library. In these stressful economic times, some of their sources have had to diminish their giving. This means they need the community to help in meeting their goal so that every child may be included in this most important program. Literacy creates a stable family through gainful employment. A literate work force can attract more industries and without such a work force our local economies can be penalized. Those persons unable to be gainfully employed pay little or no taxes. This shifts a greater burden to others. They often require unemployment or welfare benefits. Children’s Literacy Initiative says 85% of juveniles who appear in court and 75% of unemployed adults are illiterate. Of the 2566 eligible candidates in Cumberland County, 1720 or (64%) of the children are currently in the program at a cost of approximately $30 a year, per child. For the betterment of the community, more children need to be enrolled. Thousands of Middle Tennessee parents and children are thanking Nissan North America for contributing a total of $505,000 to the Governor’s Books from Birth Foundation over the past five years, a news release announced. The funds are being used to provide one free, high-quality, age appropriate book per month to children under the age of five enrolled in Dolly Parton’s Imagination Library in Davidson, Williamson, Rutherford and Franklin counties. These books help to develop the childrens’ vocabulary, a love of learning and school readiness. The generous contributions are part of Nissan’s commitment to invest in communities where its employees live and work. The most recent donation of $100,000 was divided among Imagination Library affiliate programs in four counties. A donation of $50,000 was given to Books from Birth of Middle Tennessee with $35,700 to Davidson County and $14,300 to Williamson County. Rutherford County Books from Birth received $35,700, and Franklin County Raise a Reader program received $14,300. "Nissan's dedication and partnership through the years has benefited thousands of Tennessee children, and this contribution to the Governor's Books from Birth Foundation means children who might not otherwise have access to books in their home will now receive a library of 60 books before entering kindergarten," said Governor Phil Bredesen. "It's sponsors like Nissan that are making a difference in the lives of our children, and we will see that commitment pay dividends in the future." Center Point boy gets Dolly Parton's Imagination Library's 25 millionth book! Last month, Kumar Stewart, out of thousands and thousands of children, was presented the 25 millionth book from the worldwide program. His family was told to pack their bags and head to Dollywood in Tennessee. Dolly Parton wanted to meet Kumar. "It was beautiful," mother Shalisha Stewart said of the park and her family's experience. "She sang Kumar a song, 'Celebrate the Dreamer in You.' She wrote it for him. He was like, 'She wrote me a song?' And I told him that he was the hero of the day." The Junior League of Birmingham is the sponsor for the Imagination Library in Jefferson County. Members honored Kumar and his family with a reception. "The impact that this program has on school readiness for the children of our community and across the United States, Canada and the United Kingdom is immeasurable," said Liz Edwards, President of Junior League in Birmingham. Please join the fine folks at Flagler County Imagination Library for milk & cookies, while networking and reminiscing about your favorite book growing up as they officially launch Dolly Parton’s Imagination Library. Ride will leave Waldron High School and go to Versailles, Vevay, Aurora, Batesville with stops at each. A return trip cookout will be provided when returning to Waldron High School. Money will be used to purchase books through the Dolly Parton Imagination Library Foundation for children ages birth to 5. Dolly Parton’s Imagination Library will celebrate its seventh year with a fish fry fundraiser and art auction at 6 p.m. on Sept. 25 at Mike and Jan Jaeger’s barn at 392 Arena Drive in Moscow. Tickets are $30. The live auction will consist of pieces of art by local artists. There will also be sign-ups for a Wild Game Dinner and Wild Wolf River Canoe Trip guided by David Smith. These two events will be scheduled at a later date. This just in… we have been told that on Thursday evening, August 19th there will be a story about the Imagination Library on the NBC Nightly news with Brian Williams. The story will focus on the 25,000,000th book. ...However, remember this is television news so all of this could change in a heartbeat but keep your fingers crossed that the segment will air. If we hear anything else, you will be the first to know! FAMILIES in key Rotherham suburbs are failing to take advantage of a free book scheme for under fives - and work has begun to make sure that no youngster misses out. The Imagination Library scheme was launched by country singing legend Dolly Parton nearly three years ago and since then more than 100,000 books have been given to children in the town. ADVERTISEMENTn suburbs such as Eastwood, Dinnington and Swinton are receiving books - with only 70 per cent signed up in Eastwood. Jammil Shah and his mother Margul from Eastwood were invited to their local library to join the service, which will see the two-year-old receive a free book every month until he is five. The scheme is designed to give children a love of books and reading before they go to school. Mrs Shah heard about the Imagination Library from staff at the Coleridge Children's Centre, where she works as a volunteer. Alison Lilburn, project manager for the library, said: "It is really important for us to get the message out to parents across Rotherham and particularly in areas such as Eastwood, that their children are entitled to receive these free books. "The scheme was launched two years ago by Rotherham Council and is designed to give young children access to books from an early age, as part of a range of provision to help develop their communication, language and literacy skills and improve their life chances." All books are supplied in English, but Alison said: "Even if the parent's first language is not English, the books are very pictorial and provide a great opportunity for interaction between child and adult." Dolly's donation of the Backwoods Barbie-Q II raised $90,000.00 for the Dr. Robert F. Thomas Foundation! “I never in my wildest dreams imagined anybody paying $75,000 to eat supper with me,” Parton said. For the Backwoods Barbie-Q II live auction item, the winning bidder and a guest will arrive at 5 p.m. at Parton’s Tennessee Mountain Home, her Sevierville home which was immortalized in the song of the same title. That evening, the winner can invite an additional 10 guests for a private tour of Parton’s residence followed by a barbeque on the grounds with bluegrass entertainment, all hosted by Parton. The winner and a guest will spend the night in Parton’s guest cottage, located next door to the Tennessee Mountain Home. At 9 a.m. the following morning, Parton will prepare and serve a country-style breakfast to the winner and a guest. It is only the second time in history that Parton has offered such access to her private residence. “Dolly absolutely wowed last year’s winning bidders with a truly once-in-a-lifetime experience at her Tennessee Mountain Home,” said Deborah Dowling, Executive Director of The Dr. Robert F. Thomas Foundation. Tabitha Hall and Sabrina Taylor, last year’s winning bidders, agree that the Backwoods Barbie-Q was truly a once-in-a-lifetime event. The Dolly Parton’s UK Imagination Library has reached a major milestone having now delivered over 200,000 books to under-5s across the United Kingdom (UK). In addition to celebrating this milestone the scheme has also reached another landmark in extending its relationship with its first major sponsor from the private sector. Wates Giving, the charitable program run by the Wates Family, owners of the Wates Group, is funding the Imagination Library to deliver books to under-5s in Reading and Luton. This venture forms part of the Wates Group and Wates Giving’s commitment to support literacy in communities. Around 2,000 books are set to be delivered to babies born in Luton from 1st January 2010 in the first year alone, and this figure is expected to grow to a mammoth half a million books over the next five years. Debra Helbert (right), human resources manager for Dickenson-Russell Coal Corp., a subsidiary of Alpha Natural Resources, was recently at the Johnnie B Deel Library to present a $1,000 check to the Dickenson County Dolly Parton Imagination Library Program. Receiving the check is project coordinator Phyllis Deel. 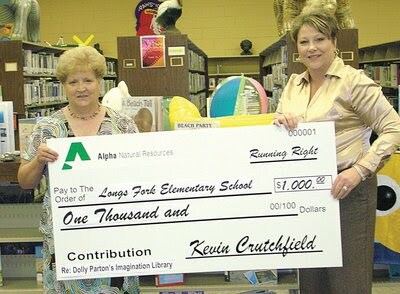 Longs Fork Elementary School serves as fiscal agent for the program. Deel noted, 'It's corporations and organizations like this that have made it possible for up to 65 percent of this counties’ children, birth—five years of age, to receive free books for the past four years." It was all smiles and laughter as the old veterans from Imagination Ashe, the Ashe County branch of Dolly Parton's Imagination Library program, formally left the program and took the next step into their literary lives. The veterans, who are aging out of the program at the tender age of five, were entertained, awarded, snacked and then sent to get their very first library card. Kathy Chefas welcomed the children and their families and briefly spoke of the program, which just recently received their non-profit status and achieved independence. 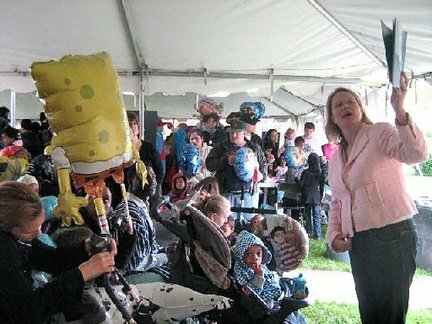 The children were then amazed and astounded by the magic and humor of Bo-Bo the Clown and his assistant Bo-Bo-ette. Peggy Bailey, Ashe Library Youth Services Librarian, told the young readers about all of the types of books, tapes and DVDs they could check out with their new library cards. The children then received medals of achievement for successfully completing the program that has helped hundreds of area children fall in love with reading. Next came the snacks; cup cakes made special for the occasion and a little time to visit with Bo-Bo and the volunteers who were on hand to support the children. Reading Program grows in North Dakota! As of Wednesday, August 4th, 399 children in Wlliston, North Dakota were signed up to receive free books through the Dolly Parton's Imagination Library program. This is more than Mike Heen, program coordinator, thought would sign up; he had a goal of getting 250 children signed up for Imagination Library. Williston Public School District 1 has raised $6,300 for the program, which is enough money to keep it going at least until next spring, Heen said. Heen met with District 1 staff earlier this year to get the program started for his Leadership Williston project. Deb Roel, parent involvement coordinator for the school district, is the contact person for the program. Roel said she's received a call from a parent in Fargo who is moving to Williston and wondered how her child could continue receiving books. Started in 1996 by the country music singer and actress, Dolly Parton's Imagination Library was created to encourage reading at an early age for a successful education. Each month, a new, carefully-selected book is mailed to the child until he or she turns 5 years old. The program is free and can start when the child is born. Dolly Parton presented the reading program's 25 millionth book to a 4-year-old in Birmingham, Alabama in June. Flagler Palm Coast Poster Contest! Dolly Parton's Imagination Library is now in Flagler County, Florida! September 1st, 2010, the Early Learning Coalition of Flagler & Volusia will partner with the Dolly Parton Imagination Library to begin this free program. 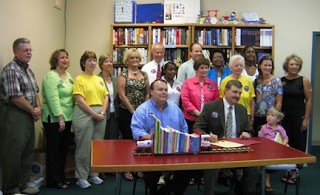 The goal is to provide free books to children in Flagler County from birth to five years of age. This is a collaborative effort between many community champions. As research shows, there is a strong correlation between the number of books in the home and children's literacy skills and academic success.